Massive Audio - RAILCAP BLX | RAILCAP BLX | Endstufen | Toms-Car-Hifi - Kaufen was Freu(n)de macht! 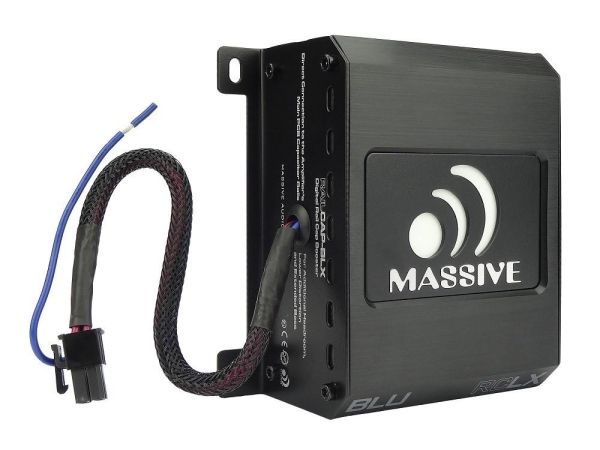 The Massive Audio “Rail CAP BLX” was designed for all Nano-Blu Series High Performance Amplifiers. With Massive Audio's "Direct Plug & Perform" technology this powerful 4 Farad Capacitor with back lit Massive logo simply plugs directly into a dedicated docking port found on the end cap of the Nano-Blu Series amplifier. The Rail CAP BLX is then automatically connected directly to the amplifiers internal power supply. When needed on demand (within milliseconds) the Rail CAP BLX will charge & discharge lighting fast power that will help stabilize the amplifiers power supply improve overall performance.